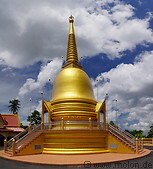 Wat Kok Seraya is a Thai Buddhist temple in the Tumpat district, with a big golden stupa and the typical walled compound setup. The highlight is the white statue of a female Buddha, which is quite unusual in a Buddhsit temple. This probably originates from the local Chinese Buddhist population and their reverence for the Guanyin goddess.